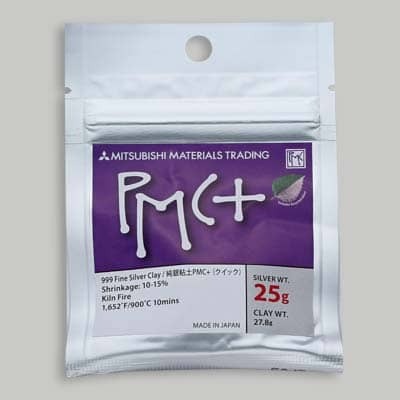 PMC+™ shrinks less and has a stronger molecular bond than original formula PMC®. It fires at a lower temperature, allowing you to combine sterling findings with your PMC+ before firing. PMC+ is suitable for torch-firing as well as kiln-firing. • Firing temperature: 1,650°F (899°C) for two hours to achieve highest hardness and maximum durability; or 1,470°F (800°C) for 30 minutes; or 1,560°F (850°C) for 20 minutes; or 1,650°F (900°C) for 10 minutes. PMC+ fires harder and shrinks less than Original PMC. It is a little less plastic to work with but more plastic than PMC3. PMC+ shrinks 12%, fires .999 pure silver. 28 grams of silver after firing.